Step 2 In a large bowl, toss the squash, potatoes, parsnips and carrots. Drizzle one-third cup of olive oil on the vegetables and season with 1 1/2 teaspoons of salt and one-half teaspoon of pepper. Toss to combine. Step 3Spread the vegetables in a single layer on a large, rimmed baking sheet and roast them until they are barely tender, about 30 minutes, tossing halfway through for even cooking and coloring. Remove the pan from the oven and toss in the garlic, then roast until the vegetables are tender, an additional 10 minutes. Step 4Meanwhile, line another baking pan with foil and place a baking or cooling rack on top of the foil. Lightly brush the fish fillets on both sides with olive oil and season each with one-fourth teaspoon of salt and one-eighth teaspoon of pepper. Wrap a slice of prosciutto around each fillet, forming a wide band around the center and overlapping the ends on the underside of each fillet. Arrange the fillets on a rack, at least 1 inch apart, and roast until the fish is opaque, is firm to the touch and begins to flake, about 10 to 15 minutes. Do not overcook. Step 5While the vegetables and fish are roasting, melt the butter over medium heat in a medium saute pan. Add the rosemary sprigs and reduce the heat to low. Cook, shaking the pan gently, until the rosemary leaves are just crisp and the butter begins to brown, about 5 minutes. Remove from the heat, discard the rosemary and stir in the lemon juice. Set it aside. Step 6To serve, place the fish on a platter or on individual plates and spoon the rosemary butter over the fillets. Surround the fish with the vegetables, garnish with lemon wedges and serve hot. In Recipes-list.com we have selected the most viewed recipes from category - Fish and shellfish Main courses . Enjoy the best recipes specially selected for you! 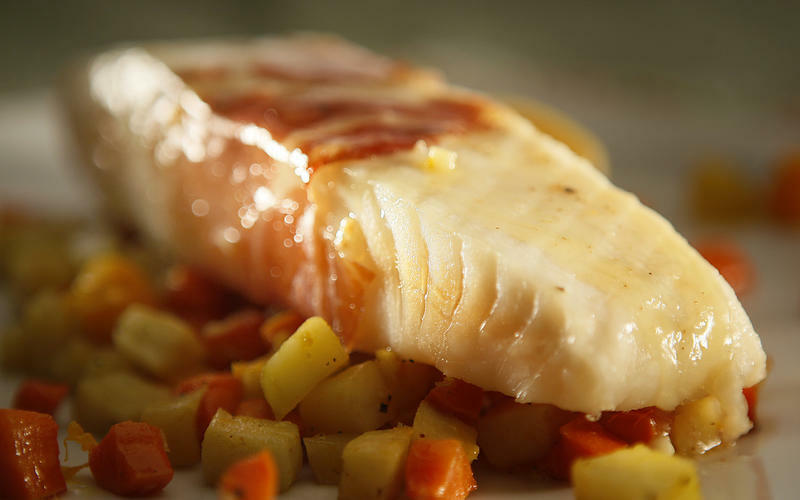 Prosciutto roasted bass with autumn vegetables is the right choice that will satisfy all your claims.